Belmont’s newest Bruins spent the day before classes began for the fall semester serving their new hometown as part of SERVE, the University’s annual orientation service event. More than 2,000 freshmen and transfer students loaded buses across campus and spent the afternoon serving at Nashville public schools and a number of nonprofit organizations across the city including The Red Cross, Project C.U.R.E. and Cottage Cove Ministries, among others. Before being dismissed to their sites, students were welcomed by Belmont President Dr. Bob Fisher in the University’s Curb Event Center. “As I told you during the recruitment process and throughout orientation, we don’t know what your purpose is in life, but we know it’s not about you,” he said. After speaking to the group, Dr. Fisher introduced Mayor Megan Barry who received a standing ovation from students as she took the stage–she received another as she left. Mayor Barry addresses SERVE participants. 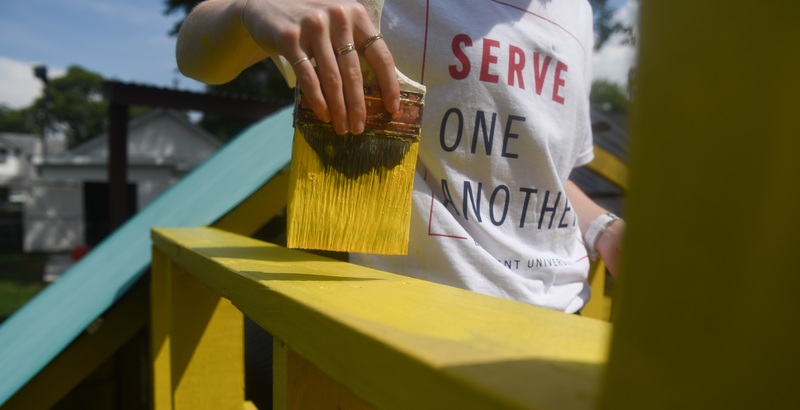 Freshman public relations major and SERVE participant Calista Ginn said the opportunity to serve alongside her fellow new students was an exciting way to learn more about her new home while doing good. “Serving is a great way to assimilate to the community and Nashville, especially for those of us who aren’t from around here,” she said. While serving at Cottage Cove, Ginn and her team completed many projects including cleaning the organization’s facility and bus, sorting donated items, painting and finishing landscaping work.